A targeted therapy resurrected by the Moon Shots Program at The University of Texas MD Anderson Cancer Center has produced unprecedented response rates among patients with metastatic non-small cell lung cancer that carries a highly treatment-resistant mutation. In a phase 2 clinical trial, the drug poziotinib has shrunk tumors by at least 30 percent in eight of 11 (73 percent) non-small cell lung cancer patients whose cancer includes an epidermal growth factor receptor (EGFR) mutation called an exon 20 insertion. Shrinkage ranged from 30 percent to 50 percent among the eight patients reaching partial response. One patient has progressed on the clinical trial, which began in March. All patients experienced some tumor shrinkage. "We've had no effective drugs for these patients, who historically have progression free survival of about two months, and a response rate of less than 20 percent for other therapies," said clinical trial leader John Heymach, M.D., Ph.D., chair of Thoracic/Head and Neck Medical Oncology at MD Anderson and holder of the David Bruton Junior Chair in Cancer Research. "These early results are highly encouraging, and our research shows that poziotinib's structure makes it a great potential fit for attacking this mutation," Heymach said. Preliminary results were presented at the International Association for the Study of Lung Cancer 18th World Conference on Lung Cancer in Yokohama, Japan, by Yasir Elamin, M.D., assistant professor of Thoracic/Head and Neck Medical Oncology. The investigator-initiated clinical trial marks the latest progress in the identification and development of poziotinib for this group of patients conducted by MD Anderson's Lung Cancer Moon Shot, which is co-led by Heymach as part of the institution's Moon Shots Program. The program was launched in 2012 to accelerate the development of new approaches to cancer based on scientific discoveries. About 2 percent of non-small cell lung cancer patients (about 3,500 annually in the United States) have an EGFR exon 20 insertion. The trial has enrolled 27 patients and is expected to enroll up to 50. Other tyrosine kinase inhibitors against EGFR have been approved by the U.S. Food and Drug Administration, but none have proved effective against the exon 20 insertion. Six of 11 patients have had their dose reduced due to side effects, mainly due to rash but also diarrhea, mucositis and paronychia - inflammation of the tissue around finger nails and toenails. Poziotinib had been tried and abandoned as a general EGFR inhibitor against lung cancer when Heymach's team turned up evidence of its potential against exon 20 through a drug screening program that's part of the moon shot. Postdoctoral fellow Jacqulyne Robichaux, Ph.D., tapped the Genomic Marker-Guided Therapy Initiative (GEMINI), which includes tumor samples and detailed clinical information on more than 4,000 lung cancer patients treated at MD Anderson since 2012. 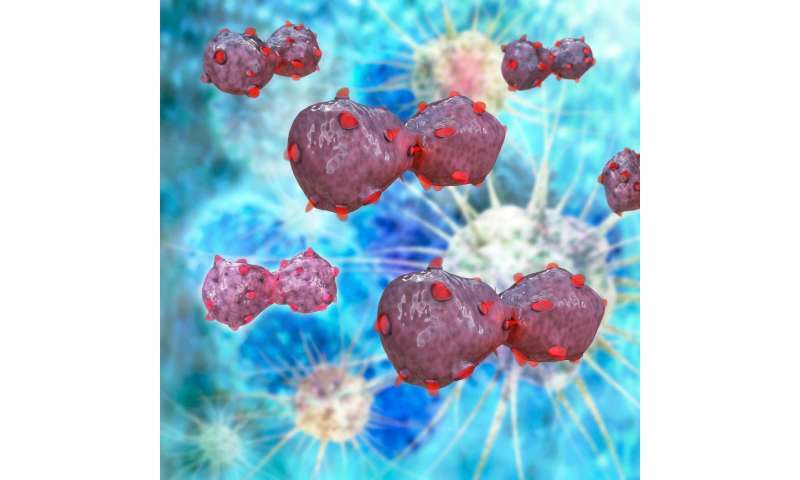 Robichaux developed EGFR exon 20 NSCLC cell lines as well as patient-derived xenograft models, and tested a variety of EGFR inhibitors against them under the Lung Moon Shot's drug repurposing program. "Poziotinib is the only drug we've ever found that was dramatically better for exon 20 than it was for the classical EGFR mutation, T790M, that everyone tests," Heymach said. Working with Shuxing Zhang, PHARMD, Ph.D., associate professor of Experimental Therapeutics, the multidisciplinary team identified structural aspects of the drug that explain that divergent impact. Heymach and colleagues then contacted Spectrum Pharmaceuticals, a Nevada-based biotechnology company that initially developed poziotinib. Subsequent collaboration included compassionate use of poziotinib for some patients with advanced disease and rapid development of the phase 2 clinical trial. The Lung Moon Shot has funded the effort from the beginning, from preclinical identification and confirmation through the clinical trial. A scientific paper describing the group's preclinical research is pending with a major journal. Spectrum has provided poziotinib and also partially funds the trial. Based on the MD Anderson team's discoveries, the institution is developing intellectual property related to the use of poziotinib for the treatment of these mutant cancers.